Reddit user rtlsdr_is_fun has updated the SDRSharp Unitrunker trunking plugin so that it works with the latest versions of SDRSharp. See the thread here for more information and a download link. 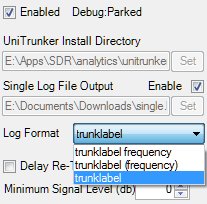 Use this plugin to allow Unitrunker to control SDRSharp, so you can listen to trunked radio conversations. A new tutorial on doing this can be found here. just try now to get it to work but no sucess what so ever !? I have everything installed like Remote.dll in folder where I find Unitrunker.xml and SDRSharp.Trunker.dll in the right place. It’s says add the line at “”, but before ” ?????????????? I find this line in Plugins.xml and tryed to add the line here but NO sucess what so ever. I would be very glad to get some advice and help from somebody who are a expert in this.